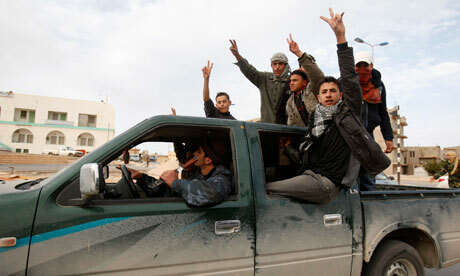 Our Tripolitanian witness is alive and well in an Arab country beyond Libya’s borders. Free to use the internet again, she has sent some old reports. This one is from March 7th. Today is the 7th March 2011, one of the most horrible days that Libya has witnessed since the ‘Greatest Libyan Revolution’ began. Zawiya has seen the nastiest massacres. The city was attacked from 8 am until 9pm; in the morning there were over 1500 protestors in the city streets, and by the end of the day there was no one. Hundreds were brutally murdered by heavy machine guns, missiles, and tanks, others were seriously injured, and some were lucky enough to stay alive. In Misurata, snipers executed two martyrs after they stopped Qaddafi’s thugs mounting the roof of their building. In Ras Lanoof, families are evacuating the city as Qaddafi’s thugs are getting more brutal by attacking houses and buildings (even mosques) and killing civilians. As a matter of fact, I received confirmed news that a whole family was viciously murdered in their car as they were leaving Ras Lanoof. So Qaddafi and his supporters are not only killing people who try to protest and stand up for freedom, but also people who want to run away for their life to a more secure area. As for Tripoli, I went out for the 3rd time since the revolution. I didn’t go further than my area, Ben Ashour. All the shops are still closed. While I was walking I found in every corner lots of bullets of different types overflowing the streets (looks like the thugs of Qaddafi didn’t clean the mess of their crimes very well after all). I also noticed more cars with Libyan-mercenaries inside observing people walking in the streets, watching people in front the small open markets, people going in and out of the mosques. A weird silence and panic is distressing the city of Tripoli, and every time I hear shouting in the streets, it means the armed gangs of Qaddafi are passing by. No-one in the street is talking about what’s going on (at least not aloud), but the silent grief can be seen clearly in many faces. It can also be noticed by the continuous civil disobedience: no-one goes to work and very few open their shops and those which are open barely receive any customers at all. I noticed a drastic decrease in the number of cabs, and then I received information that the thugs and the battalions of Qaddafi dragged many of the taxi drivers around Tripoli, lured them with lots of money, armed them and sent them to Zawiya. Some of them were threatened and joined the battalions of Qaddafi out of fear. A source told me that Qaddafi’s supporters are using fake cash in banks. The shops complain that they are running out of plastic bags and bottles (plastic bags used to be free but now we have to pay for every bag, and water prices have increased as well). People say that in another week or 10 days from today – by March 16th – Tripoli will be out of gas. The regime is falling apart gradually inside Tripoli yet Qaddafi continues making lame threats, killing more civilians, killing any rebellious supporter who thinks of joining the revolutionists before they even get the chance. The fact that many of Qaddafi’s traditional supporters are moving against him has pushed the Libyan state media to spread false rumors and create propaganda. There are organised celebrations in the streets (songs and fireworks) because the regime claims to have won back cities in the east and the west such as Ajdabiya and Misurata. We know, however, that Qaddafi is losing over and over again. He’s desperately striving to keep the spirits of his killing and torturing thugs as high as possible. The tyrannical regime is also abducting journalists, reporters, writers and thinkers to unknown places (I would guess to kill them). Despite all the criminal efforts, by God’s will Qaddafi will lose, and sooner or later Libyans and Libya will be free, and there will be no such thing as civil war between Libyans, because Libya has only one big tribe and it’s called LIBYA.